This may sound like a scenario in the distant future, but nothing could be further from the truth. KWS, a VolkerWessels company, Wavin and Total are working on the development of plastic roads, also known as the PlasticRoad. Every component of the PlasticRoad is being designed to make its application completely circular, with the goal of using recycled plastic as much as possible. The PlasticRoad concept consists of a prefabricated, modular and hollow road structure based on (recycled) plastics. The prefabricated production, the light weight and the modular design of the PlasticRoad make construction and maintenance faster, simpler and more efficient compared to traditional road structures. The PlasticRoad has a hollow space that can be used to (temporarily) store water, thus preventing flooding during extreme precipitation. The hollow space can also be used for the transit of cables and pipes, thus preventing excavation damages. And there are numerous other conceivable applications, including the installation of sensors or the electric charging of vehicles. The PlasticRoad is a completely circular product that is based on recycled plastics. It has a significantly smaller carbon footprint than traditional road structures thanks to the longer lifespan and the reduction of transport movements involved in its construction. The expected lifetime of the PlasticRoad is two to three times as long as that of traditional road paving. The expected construction time of a new road will be reduced by approximately 70%. The PlasticRoad is four times as light as a traditional road structure. The PlasticRoad is 100% circular and is made from recycled plastic as much as possible. KWS, a Royal VolkerWessels company, Wavin and Total are working on the development of the plastic Road. Three companies, each contributing its own expertise and experience to the development of this innovative concept. KWS is the market leader in road construction and the production of asphalt in the Netherlands. It knows the market well, which is becoming more demanding in terms of sound reduction, flooding, nuisance, longevity and sustainability. These requirements inspired the idea of the PlasticRoad. As a market leader in the recycling of plastic, Wavin is the perfect partner to introduce its knowledge and experience in the field to the project. Another added value of Wavin in this collaboration, is their specialisation in making plastic products for rainwater drainage. Total has extensive knowledge in the field of plastics as well. The company makes important contributions to the project with regards to improving the properties of plastics, the recycling of plastics and the available production techniques. The PlasticRoad partners have launched the first PlasticRoad in the world on September 11th 2018. It is a bike path of 30 meters in Zwolle (NL). At the moment the companies are preparing for the second pilot in Giethoorn (NL). This pilot is expected to be installed by the end of 2018. "We are proud to present the first pilot in Zwolle in September. With KWS, Wavin and Total, we now have a vast pool of knowledge, experience and resources, and can take concrete steps in the development of PlasticRoad." "Wavin and Total believe in the PlasticRoad concept and I have every confidence in a constructive and successful collaboration." The PlasticRoad concept will become reality as a bike path by the end of this year The PlasticRoad of VolkerWessels subsidiary KWS (market leader in road construction in the Netherlands), Total and Wavin, was a finalist during last Friday’s international INDEX Award ceremony. On September 1st is the award ceremony for the INDEX Award 2017. “Design to improve life” is the slogan of this largest global design award. 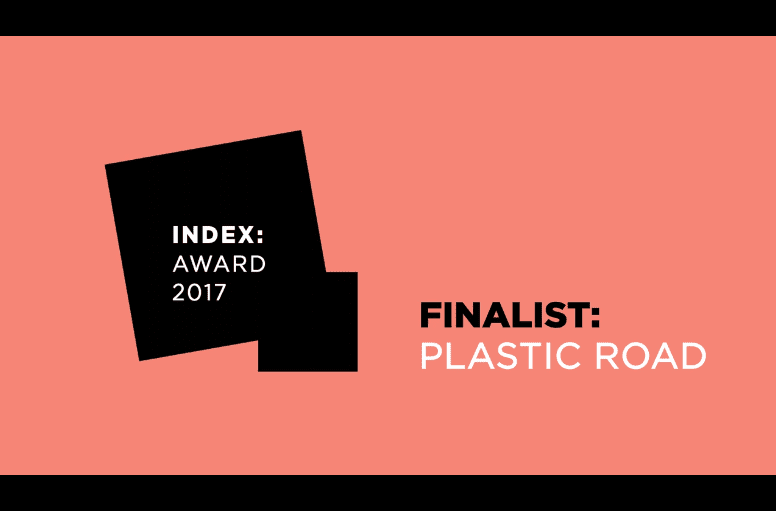 We are extremely proud that the KWS concept the PlasticRoad is one of the finalists. What is the PlasticRoad concept? The PlasticRoad is a road based on recycled plastic. It is prefabricated and features a hollow space that can be used for various purposes. This includes water storage, transit of cables and pipes, heating roads, generating energy etc. The PlasticRoad elements allow for circular reuse. What are the main advantages of the PlasticRoad? Little to no maintenance required. The material is virtually impervious to conditions such as the weather and weeds. The innovation is considerably more sustainable. The goal is to make the PlasticRoad out of 100% recycled plastic and to make it fully reusable. It is perfectly in line with the Cradle to Cradle philosophy and the principles of the circular economy. Double use of space. The hollow space in the design can be used to store water or as space for cables and pipes. The concept offers opportunities for further innovation. Examples include solar heated roads, light poles and traffic loop sensors. The concept has never been seen before in this form and with this choice of materials. This leads us to conclude that the concept is truly unique. In September 2018 the first pilot in the world was installed in Zwolle. The idea was conceived by looking at the problems that municipalities, provinces, regional water authorities and contractors (like us) deal with. This includes societal problems such as plastic waste, extreme precipitation, consolidation of the subsoil, an increasing need for mobility, and a crowded subsurface. At the same time there are increasingly stringent requirements for future roads. For contractors, asphalt is a good and decent product to build roads. However, our clients are increasingly demanding more functionality from roads. That raises the question of whether our traditional asphalt is still the answer to these increasingly stringent requirements. Roads should have an increasingly longer lifespan, shorter construction and maintenance time, be more sustainable, achieve ever-higher noise reductions and also be financially competitive. What does it take to fulfil these requirements? These questions and conditions inspired the idea of the PlasticRoad. When do you expect to build the first PlasticRoad? After a lot of research, lab tests and internal pilots, the first PlasticRoad in the world was opened on September 11th 2018. The municipality of Zwolle and the province of Overijssel (NL) together are the launching customers of the PlasticRoad. The first pilot is a bike path of 30 meters. Of which partners does the PlasticRoad consortium consist? The PlasticRoad consortium consists of the following three partners: KWS (part of VolkerWessels), Wavin (part of the Mexichem group) and Total. KWS is the market leader in road construction and the production of asphalt in the Netherlands. As an all-round contractor, KWS performs the construction of large, complicated and multidisciplinary (infrastructural) projects as well as small projects for local governments and private individuals. Wavin is the European market leader in the field of plastic pipe systems and has a large market segment and product range within the field of sustainable rainwater management. Since 2012 Wavin is part of the Mexichem Group, the Latin American world leader in the pipe system and petrochemical industry. Total is a global integrated energy producer and provider, a leading international oil and gas company and the world’s second-ranked solar energy operator with SunPower. Its activities span oil and gas production, refining, petrochemicals and marketing. In the field of polymers, Total combines key areas of expertise in catalysis, processes and products to provide high performance and durable solutions for its customers. Total supports initiatives that reduce its carbon footprint including the use and development of renewable biosourced and recycled feedstocks, in line with its commitment to better energy. Why has Total been chosen as a partner? KWS has chosen to partner with Total because of their enthusiasm for the concept and Total’s immediate pledge to be involved. Total was also chosen because of their vast knowledge in the field of plastics. This expertise includes knowledge in the areas of improving the properties of plastics, recycling plastic and the available production techniques. Like VolkerWessels, Total is also a financially strong organization that places great importance on innovation. Why has Wavin been chosen as a partner? KWS has chosen to partner with Wavin because they responded immediately when they heard that KWS was looking for partners for the concept. Wavin was also chosen because of their vast knowledge in the field of plastics. This expertise includes knowledge in the areas of improving the properties of plastics, recycling plastic and the available production techniques. Wavin is market leader in the recycling of plastic and has extensive experience with converting the recycled material into its own products. Another added value of Wavin is that the company is specialised in making plastic products for rainwater drainage. Why is Total participating in the PlasticRoad project? This agreement is aligned with our commitment to using sustainable and recycled sources and to reduce the carbon footprint of the markets we serve. We recognize that waste streams containing plastics represent a significant and often unused opportunity to further reduce the carbon footprint of our polymers. Why is Wavin participating in the PlasticRoad project? Participating and contributing to the development of the PlasticRoad fits seamlessly into Wavin’s strategy to provide innovative plastics solutions for the built environment. It is an incredible opportunity to develop a new and sustainable way to construct roads together with other market leaders in this business. What has happened since June 2015, when KWS first came out with the PlasticRoad concept? Over the last period of time, we have worked hard to answer all the questions we have received, one at a time. The first half year, we took the time to find the right partners to continue the PlasticRoad concept. We succeeded and started collaborating on the project in February 2016 with a consortium consisting of KWS, Wavin and Total. We spent a lot of time researching the questions related to the engineering of the PlasticRoad. What form can we best apply? Is the PlasticRoad strong enough to function as a road? Which plastics and production techniques are most suitable? What is the optimal design for the road for water management? We have made significant progress in answering these questions and it appears the PlasticRoad is able to meet all the requirements. Which road functions can the PlasticRoad fulfil? At this time, our aim and focus is to first apply the PlasticRoad as a bike path. Based on the findings of the pilot, we will develop the concept for other and increasingly higher-grade applications. We will examine which applications are feasible. This includes residential streets, through roads, provincial roads, highways and maybe even airports. These are scenarios for the longer term however. What is the road's expected lifetime compared to a traditional road? We expect the PlasticRoad to last three times as long as a traditional road structure. However, this will have to be proven in practice. Our expectation is based on the lifetime of other plastic products. This includes plastic manhole covers, plastic decking, plastic bridges etc. We also see great added value in the fact that these roads are prefabricated, which is always an advantage in conditioning the quality. What about sound? Is driving on asphalt more noisy or less noisy? We will have to wait and see. PlasticRoad certainly offers a number of opportunities when it comes to noise reduction. With asphalt, we are getting closer and closer to optimal structures for minimising noise pollution. In plastic, it is much simpler to produce this structure than in asphalt. By pressing or printing the structure in the PlasticRoad, we can achieve optimum sound reduction. In any case, sound reduction is not a relevant issue in the pilot (bicycle path). Won't the PlasticRoad act as a large resonance box? On a bike path, this will not be a problem in all likelihood. We will have to investigate whether this presents challenges for roads. Sound/vibrations also provide opportunities because the energy can be used to generate power. How feasible is it to actually produce plastic roads? The world’s first two PlasticRoad pilots are a fact: in Zwolle (September 2018) and Giethoorn (November 2018) the 30 meter pilots were installed. These pilots will give us insites and research data on how to further develop the concept into an actual product. Wouldn't a plastic road be too smooth to provide enough traction? What about wintertime? Of itself, plastic is not stiff enough. However, in road construction (asphalt) we have a lot of knowledge and experience in dealing with (a lack of) stiffness. We can use this knowledge to make the PlasticRoad stiff enough. We will first investigate whether we can make the plastic itself stiff enough. If this is not possible, we could also add sand or crushed stone into the surface of the PlasticRoad (by pressing or printing) to provide the required stiffness. How does prolonged exposure to the sun/UV affect the material? The civil engineering sector already produces and uses several products that are made of recycled plastic. Examples include timbering, scaffolding, sheet piling, bridges and light poles made of plastic material. These products have no problems with prolonged exposure to the sun or UV-light. The PlasticRoad consists of prefabricated parts. How will you connect these parts? There are various ways to connect the prefabricated parts. Further research will have to reveal which method is the most suitable. In the pilots were are testing the connections as well. Important for this is also how to make the best connection that will help us to install and maintain cables and pipes in the hollow space of the PlasticRoad, in the future. In the current pilots no cables and pipes are in the PlasticRoad due to current rules and regulations, besides the sensors that are installed to measure the the PlasticRoad pilots. Please read the press release of 11 September 2018 for more info. Connecting the prefabricated parts will leave seams. How will you deal with these seams? Seams play an important role in road construction. Examples are concrete roads and joints. KWS Infra has the necessary experience and knowledge to deal with this. We want to minimise the effects of seams using our knowledge and the knowledge of our partners. Will the seams form a problem for water storage? This is something that we will have to take into account when selecting the best way to connect the prefabricated parts. PlasticRoad is a lightweight construction. Won't the construction start to float when groundwater levels are high? This challenge is a potential risk that we will take into account in the development of the PlasticRoad. Floating should not occur if we allow the air to leave the construction. What are the risks of the PlasticRoad concept? As with any innovation, it is important to take stock of the advantages and disadvantages. Every innovation may encounter problems in its early stages. It will have to be assessed under the current regulations. Of course, it is a significant challenge to make a technically demanding application such as a road out of as much recycled material as possible, but we are striving for a high-quality and safe product. For the time being, we mostly see many opportunities for the development of plastic roads. The idea underlying the concept is that the PlasticRoad is produced from as much recycled plastic as possible: plastic that is currently still treated as waste (dumped or incinerated). This allows plastic waste to re-enter the chain at a much higher level and greatly reduces its CO2 footprint. Moreover, the innovation is in line with the Cradle to Cradle philosophy. We also expect it will be possible to recycle a PlasticRoad at the end of its life into elements for a new PlasticRoad (circular economy). The idea is to place the PlasticRoad directly on a surface of sand. This removes the need for a foundation. Additionally, it saves two to three layers of asphalt that no longer need to be produced. First calculations show that a road made out of PlasticRoad elements requires 85% less transport than a traditional road. Is there enough available plastic? There is (unfortunately) more than enough plastic waste in the world for the construction of PlasticRoads. More than 350 million tons of plastic are used annually. In Europe, all plastic applications together contain only 7% recycled plastic. As PlasticRoad we want to change this, with the PlasticRoad we are able to recycle large amounts of plastic in a high-quality way and give the waste a second life. The ultimate goal of the PlasticRoad is that there is no plastic available anymore in the end, because the production of new plastics has stopped and all the existing plastic is used for PlasticRoad elements. How will you get a hold of all that plastic material? To collect enough material for the production of the elements for the PlasticRoad, we are looking to use the plastic waste that is currently incinerated or dumped. We are also closely following the development of the many initiatives that want to retrieve plastic from the oceans and seas. When these initiatives manage to bring back large quantities of plastic to shore, we will certainly investigate whether this would form an appropriate source for making PlasticRoad elements. Is the PlasticRoad bad for the environment? Won't friction and wear release (microscopic) plastic particles that are dangerous for human beings and the environment? Sustainability and the environment are of paramount importance for the PlasticRoad consortium. We have investigated whether and to what extent, wear and tear takes place. The PlasticRoad is equipped with a coating specially designed for the PlasticRoad. This coating ensures that the plastic is not in contact with the tires of the traffic, preventing the release of microplastics. Besides that, a large source of microplastics / particulates is the wear and tear of tires on roads. We are investigating the possibilities for solutions at / around the PlasticRoad to beat this problem. What we have focused on in this stage of the development proces is the chance of occurrence. Due to the coating on the PlasticRoad and the use as a cycle path, the chance of a fire is considerably smaller, and it will take longer before the road would fly into the fire. When we examine the application for motorways, we will do more research on how we can prevent this. What type of plastic will you use? There are many types of plastic and therefore many types of plastic waste, each with various properties. The difference in properties of the added plastic has a big effect on the construction shape and strength of the PlasticRoad. Within the PlasticRoad consortium, this issue lies with the partners Total and Wavin, who are both specialists in the field of plastics and the recycling of plastics. In the pilots in Zwolle and Giethoorn recycled plastic (Polypropylene) was used. For this we use household waste that is currently still being dumped or incinerated. To get a better idea of ​​which products can be properly recycled in the PlasticRoad, for example: festival beer cups, cosmetic packaging, bottle caps, butter tubs, straws, plastic furniture, and various car parts. However, this is only a small selection of all products made from the plastic that we can use in the PlasticRoad. Is it possible to reuse the material of the PlasticRoad? It is certainly possible to reuse the material. In the pilots in Zwolle and Giethoorn, recycled plastic (Polypropylene) has already been used. In 30 meters of cycle path (the length of each pilot) there is as much recycled plastic as 218,000 plastic cups or 500,000 bottle caps. The plastic we use is household waste that is currently still being dumped or incinerated. However, this is only the first step that we have already taken within two years. Next to the plastic waste being recycled, the PlasticRoad itself is also circular. The PlasticRoad elements can already be used in a circular way; we can make a new one from an old PlasticRoad element. Won't animals nest or settle in the hollow space of the PlasticRoad? The elements have been designed in such a way that animals cannot enter the PlasticRoad. The pilots will help us to evaluate whether this is in line with expectations. Won't animals gnaw on the PlasticRoad? We do not expect this because the PlasticRoad will consist of a hard plastic. Hard plastics are generally ignored by rodents. Research will have to show whether this is actually the case. Do you have a question about the PlasticRoad concept? Please check our frequently asked questions first. If your question is not listed, please complete the contact form. We will answer your question as soon as possible. Want to be the first to be informed of the latest news about PlasticRoad? Sign up for our newsletter here.